Installing custom louvers is a great first step, but there’s more you can do with them! You’ve opted to install louvers, either for their privacy benefits or because of their capabilities in enhancing a facility’s security. 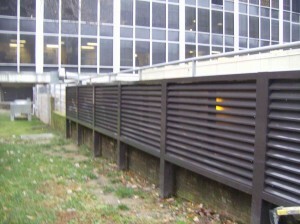 Your use of your custom louvers doesn’t have to stop once they’re installed though! There are plenty ways you can enhance your custom louvers beyond what you’re already getting out of them. Let’s take a look at some easy ways to get more out of your investment and truly take full advantage of your amazing louvers. Perhaps the street lighting you’re currently working with just isn’t doing the job and you want more adequate lighting to go along with your custom louvers. To remedy this, try installing LED lights that have a long lifespan. You can also use solar powered lights to keep the area nice and bright during the night. This is especially important if the reason you installed louvers was for security purposes, as this will help discourage any intruders from entering the area. Louvers are great because they really don’t need that much maintenance. However, you may want to walk around the area regularly just to make sure there aren’t any areas that have been damaged. Continually checking for any problems will make your louvers last even longer. Additionally, you want to make sure that any locking mechanisms haven’t been tampered with, as that could be a sign that intruders are trying to enter your facility. Landscaping is a double edged sword. On one hand, adding a bit of it can really enhance the aesthetics of your property and make everything look all that much better with a touch of green or red. That said, too much landscaping and you can create places for intruders to hide and break into your property from. If you do opt for some landscaping options, try to avoid bushes and trees as these provide too much adequate cover. Instead, opt for simple flowers that aren’t too overwhelming. Of course, if you’re not as concerned about security, some bushes can cover up the aluminum if you want to go for a more natural look! This entry was posted on Friday, June 29th, 2018	at 4:30 pm	. You can follow any responses to this entry through the RSS 2.0 feed. Both comments and pings are currently closed.